On the 19 of September 2015 around 200 of Croydon’s citizens gathered to plant a veritable shed load of crocuses on the site of the former Taberner House right in the town centre. What had been a dream of Croydon resident Ally McKinlay four short weeks previously, had just come dramatically to life. So, how did he make it happen? As soon as Ally discovered that, for a short time only, the vacant lot next to Croydon council was sitting fallow, he began to envision a project that he’d been passionate about for a long time. Crocuses. Wait, what? Outside of Gardener’s World, it’s not often you get someone beating the drum for a couple of flowers but as Made in Croydon host Ally had discovered, crocuses formed a serious part of Croydon’s history. 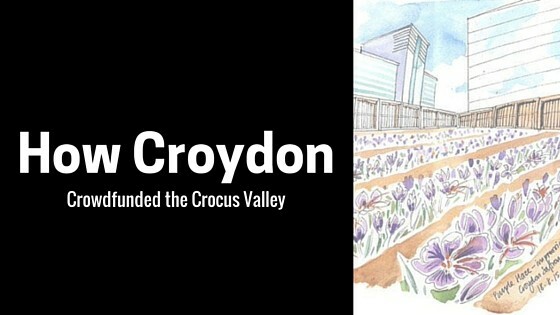 In fact crocuses actually gave Croydon its Anglo-Saxon name, crocus (“croh”) and valley (“denu”), and Ally wanted more people in Croydon to be proud of the beautiful and historic roots of their town. And as the crocus is the source of saffron (imagine delicious saffron rice…) there would be a tangible benefit to creating this wild flower patch in the heart of the city. With limited time before development began on the lot and with no real resources other than his own passion and enthusiasm, Ally set to work. Using Spacehive to lay out his idea, what was needed and how much this project would cost – Ally began sharing his vision with friends, colleagues, the community and local businesses. And the more people learned about Crocus Valley, the more they volunteered time, funds and resources. One business offered to supply free earth for planting and another discounted the cost of the crocus corms. In record breaking time, the whole community rallied and funding was complete in less than a week. The first steps were to repair the ground from when Taberner House was demolished; removing broken glass, tiles, metal, stone etc. and preparing space for planting. Then on the 19 of September everyone gathered for the “Big Pot Up”. 10 tonnes of earth, 21,000 crocus corms and 200 people ready to get their hands dirty made for a brilliant day of tea, cake, music and of course the potting of the plants themselves. One month later the first Crocus Sativus was spotted in full bloom. And in November, harvesting happened with over 8,000 flowers picked containing around 25,000 saffron strands. Cutting just below where the three saffron strands connect so that everyone could continue to enjoy flowers in bloom. Already Croydon residents have begun to reap the rewards of their saffron harvest with everything from saffron rice and cake to a saffron martini. For more saffron inspired kitchen delights, check out BBC Good Food here. What next for the Croydon community? Croydon blossoming with its own Saffron farm was just the beginning. Then came the South Norwood Playground project and the Croydon Interfaith Bike Ride and Picnic. For more projects from Croydon Live, follow their Movement for the latest news and updates and learn how you can bring your ideas to life.